Now is the time to join your blog up with the rest of us for the Shape Up for Summer Giveaway Blog Hop. If you haven't joined up for the fun with us in months past, let me explain what a Giveaway Blog hop is. Each blog hosts their own giveaway May 9th - 25th. At the end of your giveaway post, you will insert a code (which I will provide you with) that code will contain the list of all the other blogs in the hop. So after someone enters your giveaway they can hop on over to the next giveaway on the list. How does this benefit you? The idea behind it, and how we've seen success in the past hops: one blogs followers will enter that particular blogs giveaway, and then they will see the link to the others and visit your blogs giveaway. So the chance to quire lots of new followers who may not have found your blog otherwise is there. Additionally, it is a lot of fun to be linked up in the hop with all of the rest of us. 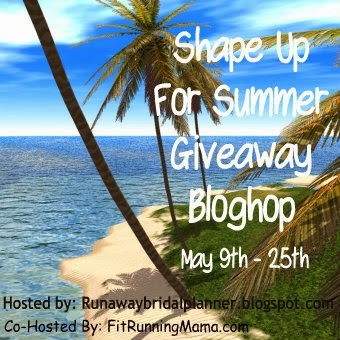 Shape Up For Summer Giveaway Blog Hop sign up will run now through May 5th, 2014. Item(s) you decide to use in your giveaway should be somewhat fitness related, gift cards are also okay! Below is the list of simple rules for linking up with us and joining the hop. PLEASE make sure you read them first BEFORE signing up. Then make sure you can AGREE to ALL of them! If you have any questions, please don't hesitate to ask!!! 1. FIRST, Make a note on your calendar so you don't forget you signed up. 2. Giveaway item needs to be relevant to the type of hop. Anything health or fitness related - gift cards are okay. You can do a package and add other items to your giveaway that are not fitness related. You can even do more than 1 giveaway on your blog for different things. Just make sure 1 of them is fitness related. The choice is entirely yours! 4. REQUIRED at the bottom of your giveaway post, will be the LINKY that has the link to all the other blogs participating in the hop. It is a hop, so this is required! We strongly recommend you try to do this! If you do not know how to insert an HTML LINKY, it will be a requirement to link to the Hosts Giveaway Post - The links will be emailed to you May 5th, so you can prepare your post in advance. 5. You are welcome to have no entry requirements, or requirements for entries, the choice is all yours! For the hop we ask you limit it to only 1 Mandatory entry, and ONLY up to 10 total possible entries. (Example: You can ask them to follow your blog as their 1 Mandatory entry then offer them other options to follow you, twitter, facebook, leave a comment etc...) The simpler you keep it, the more entries you are likely to receive! 6. Your post must go live by 8AM EST on May 9th, 2014 and run through midnight May 25th. Everything is up to you on how you design the rest of your giveaway, but it must be kept family friendly, and appropriate for all audiences, any pictures visible on your blog page during participation in the hop should also be appropriate for any age audience. Anyone who doesn't comply with this will be deleted. 7. I will send you 2 reminder emails to post your giveaway, along with the Linky and Image for your post - Add my email (runawaybridalplanner(at)hotmail(dot)com to your contacts, so your reminder emails will not go to junk. (Instruction email will go out on May 5th - Final reminder will go out on May 8th.) Your email will only be held and used for this hop only. 8. The rest of the post and how your do your giveaway is completely up to you. 9. You will be responsible to ship the item to the winner - all shipping costs are your responsibility. If you are using a sponsor, you will be required to work with the sponsor to have the item shipped to the winner. 10. Anyone who is not following the rules, may be deleted from the hop. It is important to follow the rules so the hop can be the most successful for everyone participating! ** If you sign up and cannot participate, please let me know and I will remove you at anytime. ***Feel free to Email me or comment below with any questions. I'm always looking to make these hops bigger and better. So if you have any idea's, I welcome you to share!